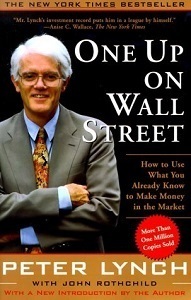 Peter Lynch is one of the greatest fund managers ever. Though, it’s been over two decades since he managed money, the lessons he learned are timeless. Lynch ran the Fidelity Magellan Fund from 1977 to 1990. During that time, he beat the pants off the market. He outpaced the S&P 500 11 out of 13 years, averaging a 29% annual return. From start to finish, that’s a 2700% return! Lynch documented his experience in two books: One Up on Wall Street and Beating the Street. The lessons you’ll take away from both books far exceeds the ten below. 10. There is always something to worry about. Every day brings something different to worry about – inflation, recession, depression, natural disaster, war, market crash, and that bus when you cross the street. In the last 100 years, the market has seen it all and recovered. You can wait for the sky to fall or you can invest knowing it will happen, you’ll get through it, and the market will too. 9. Learn from your mistakes. Every great investor I’ve come across owns their mistakes. They focus as much, if not more time studying their mistakes than they do their successes. Every investment they make has a theory behind it. Whether they make money or not, they ask – why was their theory right or why was it wrong? Know what was wrong so you don’t repeat it. 8. If you need the money, don’t invest in stocks. Lynch was straight forward about not taking chances in the short-term with money you can’t afford to lose. Money needed in the next two or three years should be kept in low-risk investments. Stay away from the quick buck mentality and stick with investing for the long-term. 7. If you spend more than 13 minutes analyzing economic and market forecasts, you’ve wasted 10 minutes. The economy and the stock market are not the same. The economy is a huge machine with hundreds of moving parts that make it impossible to forecast its future. A company, however, is a singular part that can be simply measured. You can waste a lot of time trying to find out where the economy is headed or you can spend that time finding out what’s happening to a company. …because sooner or later, any idiot is probably going to run it. Good management is important, but it’s the business that matters. A good business will do great under good management, but without it, the business is good enough to get by until a new good management is found. 5. The best stock to buy is the one you already own. Buffett has a similar saying along the lines of why invest in your fourth or fifth best idea when your first or second is so much better. You bought the stocks you own for a reason. You’ve already done the research. You know the company well. If the story hasn’t changed, and the price is attractive, the stock should still be a good investment. You shouldn’t own it otherwise. 4. Know what you own. Lynch’s philosophy is invest in what you know. That’s oversimplified to the point that some investors take it literally. They buy a stock because they shop at a certain store or buy a product, without doing more research. They don’t know what’s going on inside the company. If you can’t explain what a company does in 30 seconds or less, you shouldn’t own it. You can say the same about mutual funds, annuities, life insurance, and other financial products. Should you put money into something when you don’t fully understand how it works? 3. Don’t pigeonhole yourself into one investment style. Lynch is best known for GARP, growth at a reasonable price. His real investment style was flexible enough to adapt to whatever was going on in the market. He understood markets are cyclical, styles go in and out of favor (a style goes out of favor once everyone jumps on the bandwagon and in favor once the last person gets off). Instead, Lynch broke stocks into six categories or stories, turning to each at different points in the market cycle. Once you’re married to one style, you’re stuck, sometimes waiting years before it comes back in favor. That requires a lot more patience than most of us have. …is like trying to catch a falling knife. Stocks fall for a reason. Find out why. Sometimes management fixes the problem and the stock recovers. Often times they don’t. Lynch was great at finding these turnaround stories, but he warns that management will always tell a great story. Stocks of bad companies will fall further when the story ends up being a fairy tale. It’s better to wait until a company has proven itself, and the stock has turned, before buying. 1. After a great run, don’t be afraid to get out early. At the height of Lynch’s success, he called it quits. That was 1990, just before one of the biggest bull markets in history. He managed 1,000 or more stocks and ran the biggest mutual fund at the time. He writes about how family vacations are filled with him visiting companies, doing research, and calling the office. He worked nonstop. Something had to change. You can easily let work (or investing) be your life or you can find the right balance so you have a life. This post was originally published on June 5, 2014.